Join us in saying yes and...anything! Spread the word, and get friends to donate! Any size gift helps, and many prizes are awarded for the most unique donors. The Big Payback is back on May 2, 2018, and Unscripted is excited to take part in this monumental charitable event for its fifth annual giving day challenge. The Big Payback, hosted by The Community Foundation of Middle Tennessee, is a 24-hour, community-wide, online event that celebrates Middle Tennessee’s spirit of generosity and supports the life-changing work of area nonprofits. The Big Payback helps organizations, like Unscripted, raise much-needed funds while bringing awareness to pressing needs in our communities. Donations made during The Big Payback are amplified by incentives and awards made possible through sponsors, which may help us to qualify for prizes and bonuses through the day. In the past four years, the Middle Tennessee community has paid back hundreds of local nonprofits – including schools and religious institutions – in a big way, raising more than $9.3 million. And even more encouraging ... more than 18,800 donors have self-reported making a gift through The Big Payback to a nonprofit they had not previously supported. That’s A LOT of new donors in four 24-hour giving days! 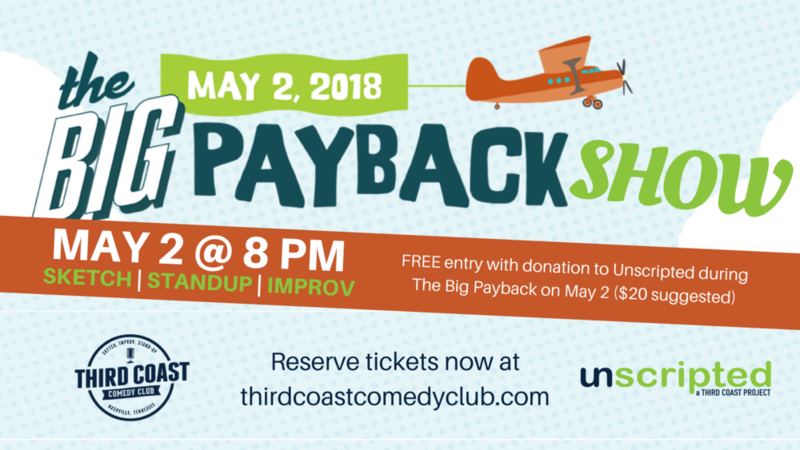 We hope you’ll support Unscripted and our mission to enhance the wellness of our community through improv on Wednesday, May 2 during The Big Payback. For more information, contact us or visit TheBigPayback.org. Thank you!